Multifaith Voices for Peace and Justice is one of the co-sponsors for RISE for Climate, Jobs and Justice. On the morning of September 8, we will go to San Francisco to join other peace and justice organizations in the Bay Area in the largest climate march the West Coast has ever seen. However, there are additional contingents that will represent related concerns. Two of these connect particularly to MVPJ activities. Please note that the Faith Contingent and the No Nukes contingent (see details on each below) will be marching side by side, so you can join one and visit the other as you march! 1. 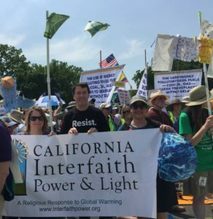 The Faith Contingent, organized by California Interfaith Power and Light, will spotlight the commitment of leaders of faith communities to the cause. They will gather at 9:15 am at Ferry Park for a multi-faith prayer service, Shabbat service and send off. Then they will re-group across the street at the designated place in the march line-up at Embarcadero Plaza. The march begins at 11:00, goes up Market Street, and ends with a resource fair and creation of the largest street murals project. Religious headwear, clerical collars, stoles, banners, shirts and signs that proudly celebrate your religious community's participation are all warmly encouraged! It will be helpful to RSVP for the Faith Gathering by clicking here. 2. The No Nukes! No Wars! No Warming! Contingent will focus on the twin existential threats posed by climate change and nuclear weapons. This contingent is sponsored by the Western States Legal Foundation, the SF Bay Area Physicians for Social Responsibility, Tri-Valley CAREs, and the Livermore Conversion Project, an umbrella group of dozens of organizations. Gather at 10am in front of the Vaillancourt Fountain in Embarcadero Plaza. (From Embarcadero BART station walk to the end of Market St. facing the Ferry building and turn left.) Look for the " March for Nuclear Abolution and Global Survival" banner. This contingent will march in section 3 of the march, "We Rise for Democracy." Use their Facebook page for more information, and to help spread the word. RSVP for this contingent by clicking here. Hope you will join in this event in whatever way fits for you! We recommend using using public transportation – Caltrain, BART, etc. "Rise" is a global event (click here to see a world map marking the amazing span of action! ), and the largest mobilization will be in San Francisco. The march is planned for the weekend before the international Global Climat Action Summit (GCAS) in San Francisco convened by Gov. Jerry Brown and other international climate leaders. The goal of the GCAS is to accelerate climate action in advance of 2020. This is important because not only has the United States pulled out of the Paris agreement, but the commitments made in Paris are not sufficient to achieve the stated goal of keeping warming “well below” the 2-degree Celsius. According to scientists, the 2-degree threshold is the absolute upper limit our world can withstand without catastrophic impacts.